Emory employee Kimberlee Tate shares her experience with the free Healthy Lifestyle Coaching program from Aetna. Emory Photo/Video. When Kimberlee Tate had both of her feet surgically broken last year, she knew she needed some extra help. She turned to Aetna's Healthy Lifestyle Coaching Program, a benefit that is offered through Emory's medical plan, to give her the additional motivation she needed. "I am extremely independent, so having both of my feet broken became a really huge obstacle. 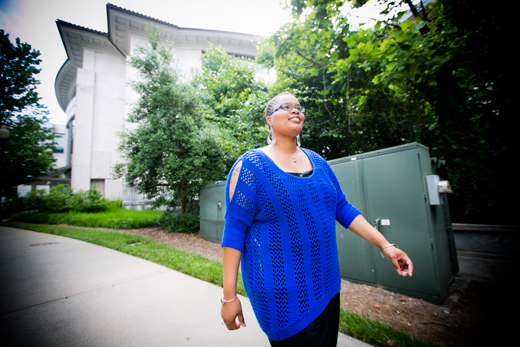 I had to learn to ask for and accept help," says Tate, who works for Emory Libraries. "My Aetna wellness coach, Melena, encourages me to work on stressors and set personal goals. She also helped me realize that small changes make a difference and motivate bigger changes." With the Healthy Lifestyle Coaching Program, Emory employees can work one-on-one with a health coach over the telephone to improve their health and make positive changes. Aetna's health coaches use goal setting, professional guidance, and social support to help employees make and sustain lifestyle changes related to eating, physical activity, stress management, weight management and tobacco cessation. "This is an excellent benefit that is available to our employees," says Michael Staufacker, director of health management. "In our busy lives, how often do we get to spend 15 minutes talking to someone who is focused on our own personal health and wellness? This is a free, confidential and convenient way to start or continue to improve our health and well-being." Some reasons people may decide to work with a health coach are to get in shape, lose weight, reduce stress, quit smoking, sleep better, have more energy, or create balance in their lives. Professional health coaching helps employees identify health behaviors to improve, overcome barriers to change, and discover other resources that support positive change. "Those who participated in Emory's Know Your Numbers Campaign or the Online Health Assessment took a great first step by getting a personalized snapshot of their current health status," says Staufacker. "But it's also important to take the next step and make positive changes today that can greatly improve your health for the future." The Healthy Lifestyle Coaching Program is available to all benefits-eligible Emory employees/retirees and their dependents (age 18 and over). Individuals can start a health coaching program by contacting Aetna directly at 1-866-213-0153 or by emailing HLC@aetna.com. The program also comes with an added bonus: participants receive a $25 Corporate Rewards gift card after completing three coaching sessions; and an additional $25 gift card after completing a six-month follow-up call with a health coach. "When it comes to doing something for your health or to enhance your life in any way, step one is to know that you are worth it," adds Tate. "Never in my life would I have expected the support and encouragement that I received from complete strangers, co-workers, family and friends."